Tarleton’s National Intercollegiate Rodeo Champions of 1967 were honored at homecoming the same year. Members of the team were (from left) Charles Bitters, Johnny Edmonson, Randy Magers, Coach Carl Chumney, Lionel Lane, Bobby Hungate and Billy Albin. Not pictured Terry Walls. Leaving a legacy in the rodeo pen is something not all cowboys and cowgirls accomplish in their rodeo days. 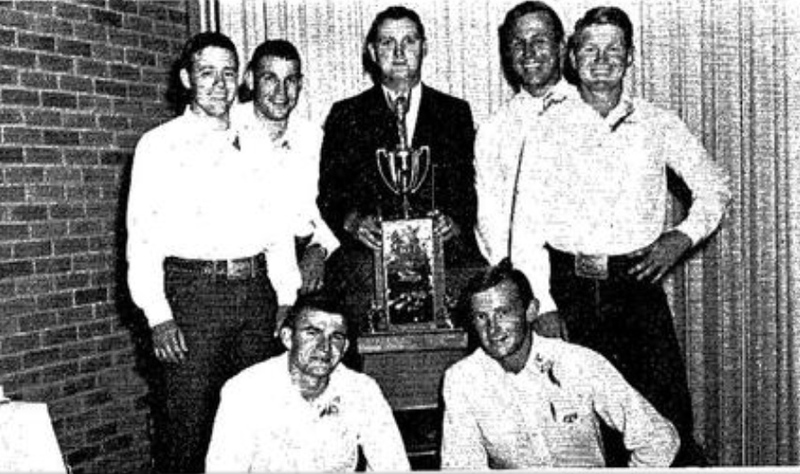 In 1967 seven members of the Tarleton Men’s Rodeo Team did just that — after only three years in the National Intercollegiate Rodeo Association. The team has been selected for induction in the Tarleton Rodeo Hall of Fame. This is only the second year of induction. The 1967 team won the first national title for the Tarleton men. They did so by a landslide of 525 points, with the second place team collecting a mere 250 points. Winning the trophy cost the men a total of 11,000 miles and the men were at rodeos 11 months out of the year. Every person who was on the 1967 National Championship team went on to graduate from Tarleton. Hall of Fame nominees will be recognized with a luncheon and introduction at the NIRA Stampede Rodeo in Stephenville April 20. Tammy Wiederhold is junior public relations and event management major from Lexington, Texas. If you are another publication and you wish to use this story, please refer to our guidelines here.